Two days ago I received the first Shave Select Subscription Box for Wet Shavers. The “Starter Kit” comes in a plan cardboard box with the “Shave Select” Logo printed on the Top. The box came with 10 items. For a starter Kit, it’s everything you need for the beginner. It would have been nice to have some type of instructions showing how to Wet Shave or how to use the two supplied razors which are very different from each other. I priced each item on line and not surprisingly I found them cheaper on the Shave Select Website. The exception was the Shaving Bore Brush, Shavette, SSN1 Razor. Couldn’t find them online anywhere. They currently have $40.00 crossed out then $25.00 value on the website for the Box. They carry 26 Brands currently and plan on expanding very soon. If you live in the USA the Box is shipped to you FREE! They also ship to military addresses. I haven’t used any of the products in the box so I really can’t comment about the quality. 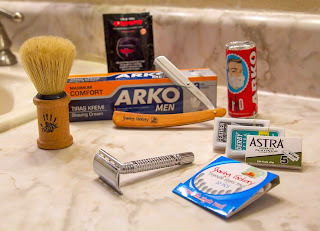 If I had to pick what I would use it would be the ARKO products the shaving Factory Brush, Disposable Styptic Pencil 20pcs and the SSN1 Razor. I really wanted the Omega brush that was pictured on the website but products will vary due to limited stock. Wow, surprisingly I never knew this.Really Great tips ! The safety razor blades is great products, I'll have to check them out. Thanks for sharing ! What was in the second box?